Ready-made blockout lining tape provides instant 100% block out when attached to your existing ready-made curtains. View all of the product options online. 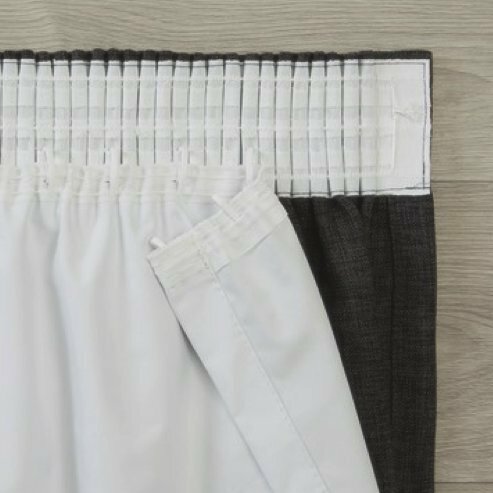 Lining tape allows this curtain to be attached to the back of any taped curtain by using standard curtain hooks. This product can only be used in conjunction with a taped curtain (lined or unlined) to block out light. It is not necessary to gather the blockout lining before attaching to the taped curtain. 80% Polyester/20% Cotton. 3 Pass coated blockout (total blockout). Hand/machine wash, cool iron, do not bleach, do not tumble dry, do not steam, do not dry clean.